Piaggio launched the first Vespa model and with it the scooter phenomenon in the spring of 1946. The scooter revolutionised personal transport, and helped liberate a war torn Italy through mobility. Piaggio is Italy’s number one scooter brand and the maker of Vespa. It's official: Piaggio's X9 Evolution 500 is now the best value for money over 250cc maxi scooter in Australia. Two new maxi scooters are now on sale in Australia: Piaggio X8 250ie and the Gilera Nexus 500. The fuel-injected X8 250ie now delivers more power and performance with an exhilarating mix of style, comfort, performance and protection. The species continues to evolve. 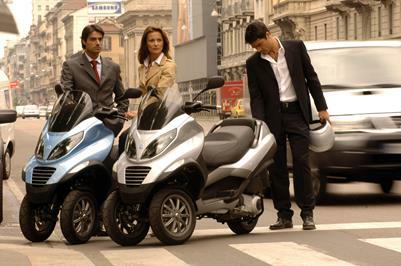 With over 410,000 vehicles sold over the last decade, the Piaggio Liberty, which started off the high wheel scooter sales phenomenon, remains an exceptionally successful product. An all-new range of the Piaggio X8 is available in 2006, with no fewer than four versions designed to satisfy the diverse needs of town commuters and out-of-town travellers.